About Shen Shi’an 沈时安: An independent Buddhist teacher, writer, poet, translator and editor, he was one of the founding members of the Dharma Propagation Division of Kong Meng San Phor Kark See Monastery (Bright Hill Temple in Singapore) in 1997. Holding an MA in Buddhist Studies, which covered the major Buddhist traditions, he served as a Dharma Trainer and Project Coordinator in its Community Development & Training Department until 2011, focusing on Buddhist research, writing, teaching and answering of media queries. He was the founder of the temple’s Youth Mission (now ‘KMS Youth’), a book purchaser for its Awareness Place project, and the Chief Editor of the Web (and Library) Department, which co-supported Buddhanet.net, a popular Buddhist education website. He is the founder and editor of TheDailyEnlightenment.com since 1997, one of the world’s largest independent Buddhist inspirational e-newsletter with over 29,000 members, the editor of ‘Be a Lamp Upon Yourself’, ‘The Stonepeace Book’ (Volume 1 & 2), ‘Awaken: Gateway to Buddhism’ and the writer of ‘The Daily Enlightenment (Book 1-5)’ and ‘The Amazing & Amusing Adventures of Sam & Sara: The Zen of All Kinds of Stuff!’. He also contributes occasionally to magazines such as ‘Nanyang Buddhist’, ‘Awaken’ (for which he was a Contributing Editor), ‘For You (Information)’, and ‘Eastern Horizon’. 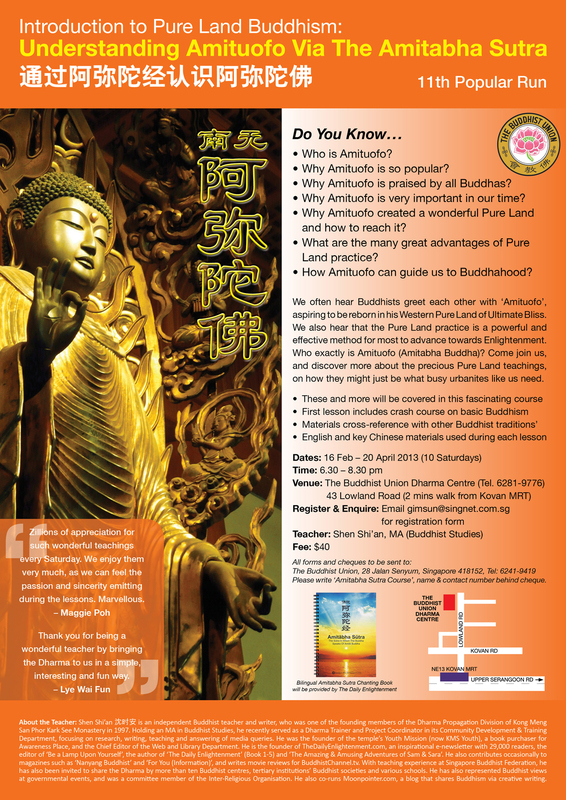 He served with the film selection team of a Buddhist film festival, writes movie reviews for BuddhistChannel.tv, the world’s leading Buddhist news network, and popularised Dharma@Cinema, which is an innovative way of sharing the Dharma through detailed reviews and discussions of both popular and offbeat films. Specialising in the Pure Land teachings, he has taught the subject at Singapore Buddhist Federation, Kong Meng San, Pu Ji Si Buddhist Research Centre and Poh Ming Tse, while leading an ongoing weekly Pureland Practice Fellowship. He is also occasionally invited to conduct Dharma discussions for youths of tertiary institutions’ Buddhist societies (NUSBS, NTUBS, SIMBB, NYPBS, NPBS) on various subjects, and to introduce Buddhist life perspectives at Secondary Schools (St. Patrick’s School, Manjusri School), Junior Colleges (Catholic Junior College) and International Schools (UWCSEA, SJII). He was also invited to share on Buddhism by Dharma Drum Mountain (Singapore), Fo Guang Shan (Singapore), Tai Pei Buddhist Centre, Singapore Buddhist Mission Youth, Singapore Buddhist Youth Mission, Wat Ananda Youth, Buddha of Medicine Welfare Society, Buddhist Fellowship, The Buddhist Union and Kampung Senang. He has also been invited to Indonesia and Malaysia to teach. He also co-runs Moonpointer.com, which is a community blog that promotes creative sharing of Buddhism via thousands of articles. He can be reached at tde [@] thedailyenlightenment.com for invitations to share the Dharma via talks and classes. Hi, I would like to attend the above class but as I’m overseas, I will miss the 1st class. May I know what will I miss? Thank you for your teachings. The lessons are well-paced and after each lesson, the faith in me grows a little bit more. I’m glad my hubby sign me up for the lesson as I don’t see the need to attend since I can access to the sutra and notes of the previous class my hubby attend. After the end of last week’s 8th class and Bro Steven’s sharing, I walked out of BUDC feeling very happy despite the drizzle. Some kind soul helped to arrange/kept our shoes out of the rain. Another declined my offer to share umbrella as he may be driving or waiting. A Chinese-looking lady standing at the bottom of down-escalator looking around,saw me smiling at her, waiting for her to ask,but merely returned my smile. Once on bus, quickly whipped out HP to txt SMS ‘AMTF AMTF..’ and almost filled length of 12 SMSes during the usual 17-min ride. Once home, 89cm-son fell down from dining chair standing to drink oat cereal drink, landed on left sideways,unhurt, no cry/word/discomfort. Split 50% of half ounce drink,hand still holding cup. Both hubby and myself standing 2-3 arm length away,witnessed,speechless,but felt son was as if lifted and merely placed on floor. We’re not sure if this is the goodness of Buddha’s protection,but we are sure nianfo and being mindful of Buddha is wonderfully great! May you have a great AMTF day!